Oil-Electric: "E" Means "Eighteen Hundred!" Union Pacific 989, Argo yard, Seattle, June 1960. I caught this magnificent E7A passenger unit and her cohort, resting up before their early morning run tomorrow. She will depart Union Station at 8:30 AM with #106 southbound Domeliner City of Portland - St. Louis service, arriving in Portland at 12:30. The letter "E" designated "E-ighteen hundred horsepower." That was the original E1's horsepower rating. The E1 had two GM12V-201A, 900 hp motors. The letter "E" was retained through the model E9, despite improvements in prime mover. 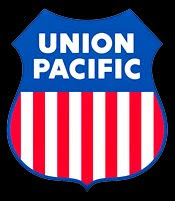 In addition to "Radio and Recorded Musical Programs" being available, Union Pacific was "pet friendly!" "Dogs and other small household pets may be transported in baggage cars ... or they may be taken into room accommodations, when in suitable containers, subject to Pullman Company regulations." The 1950's into early '60's were the days. 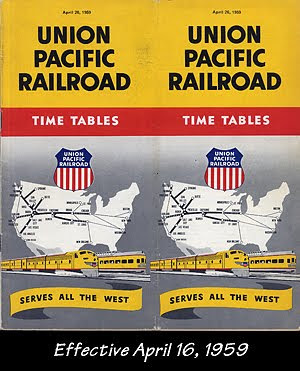 Union Pacific ran up to four trains daily between Seattle and Portland, including the Portland Rose - Yellowstone summer time service. Railroad Stuff: General Motors E7. Prime mover 2x GM12V-567A 1,000 hp. 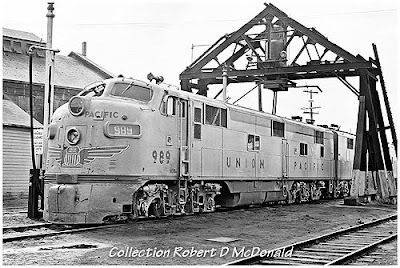 Union Pacific 989, built as UP 930J, August 1946, sn 3507. Renumbered 989J March 1948. Renumbered 989 December 1948. 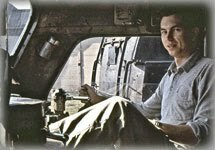 Retired December 1963. Traded in to EMD for E9A UP 913, December 1963.